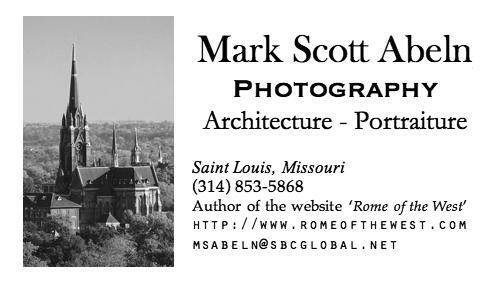 HERE ARE PHOTOS of All Saints Church, in University City, Missouri. 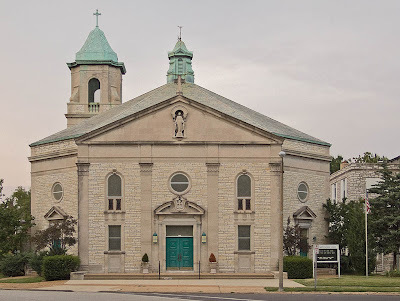 This is one of four parishes in University City, an inner-ring suburb of the City of Saint Louis, named after nearby Washington University. The church is about 8-½ road miles west of the Old Cathedral. The parish dates from 1901. 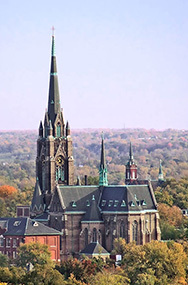 At the time, many wealthy Saint Louisians were moving west out of the city along the 'central corridor', which includes University City, a trend that continues to the present day. 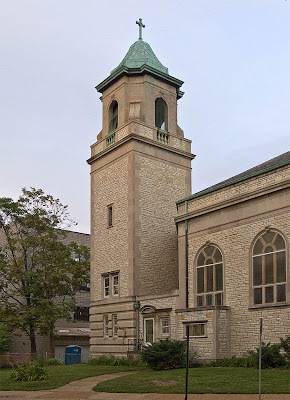 This church was designed by architect Henry P. Hess (1884-1957), who also designed the remarkable Saint Cecilia Church and Kenrick-Glennon Seminary. The church is two blocks north of The Loop, an entertainment district popular with college students. 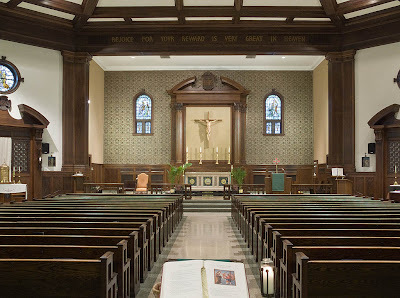 A panoramic view of the interior of the church; click image for larger version. Near the center you can see the baptismal font in the foreground, and the tabernacle in the background. To the far left is a modernistic statue of Saint Anne, mother of Mary. The interior of the church is octagonal in shape, and there are no columns or side-aisles. The ceiling forms a dome over the nave. 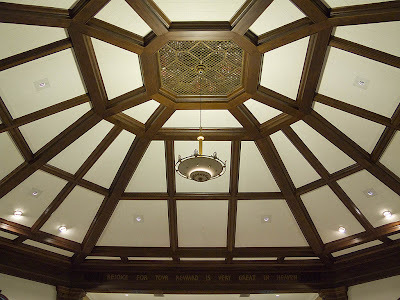 The interior is decorated in the Colonial Revival style, which is known for its simplified Classical elements. The sanctuary, with the exception of the altar itself, it is quite spare. 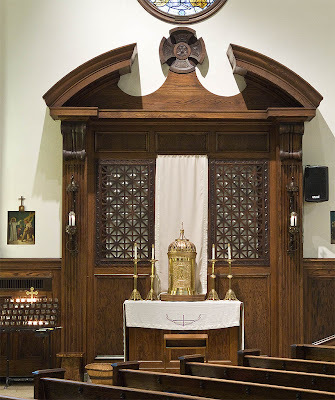 Note the intact communion rail. I was told that this was Archbishop John May's favorite church. 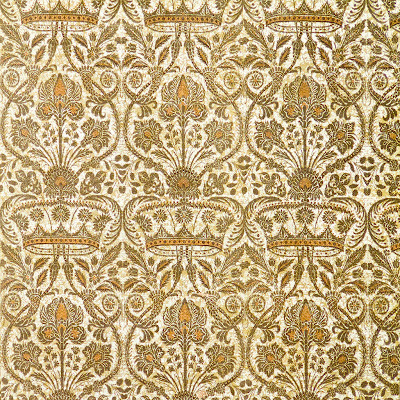 Wallpaper in the sanctuary has detail that resemble crowns and fleurs-de-lis. The tabernacle is to the left of the sanctuary. 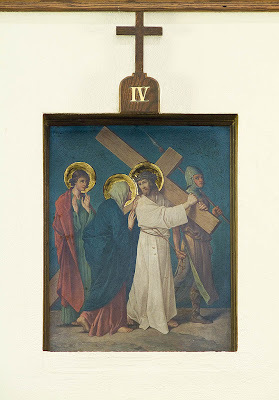 The IVth Station of the Cross: Jesus meets his mother. Consider, the meeting of the Son and the Mother, which took place on this journey. Jesus and Mary looked at each other, and their looks became as so many arrows to wound those hearts which loved each other so tenderly. The Stations here are paintings set into wall niches. 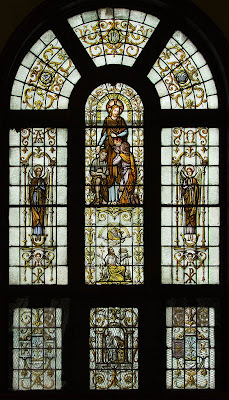 The stained glass windows are mainly white and brown, matching the interior. 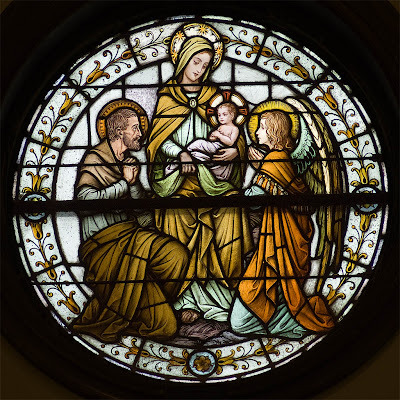 Here is a window of the Holy Family, located above the tabernacle. A soldier kneels before Christ in this window. "Blessed are the peacemakers". Many thanks to Father and the parishioners who welcomed me to this parish. There was a third step with the inscription "Sanctus", but it was wreckovated. It would also complete a nicely designed Church to move the tabernacle back where it belongs. Tip : promote your blog in http://www.piecelibrary.com/ by writing an article there and make a link to your blog in the bylink. Your blog will attract more visitors. Great pictures as usual! 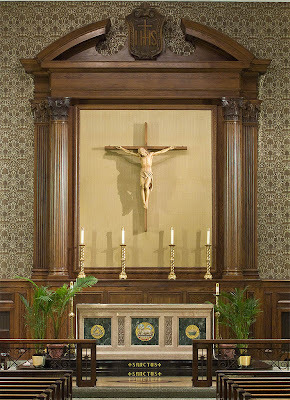 In regards to thetimman's comments -- any idea what the altar used to be where the tabernacle now sits? wow, viewing these pics sure brings back some memories. started kindergarden back in 1954 at all saints school. 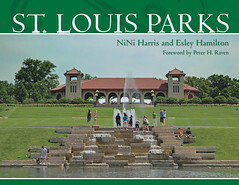 attended until 4th grade when parents moved to florissant. church is still as beautiful today as i remember way back when. i now live in roswell ga. and still find myself reminicin about those days when mass was said in latin and life was so laid back. wish there was a way to have a class reunion with kids i knew back then but i guess thats impossible. I went to school there from 1953 through 1959. My name was kathy roth back then. I remember the walls on both sides of the Altar were all mosaics, anyone remember that? I attended school there from 1953 to 1959. 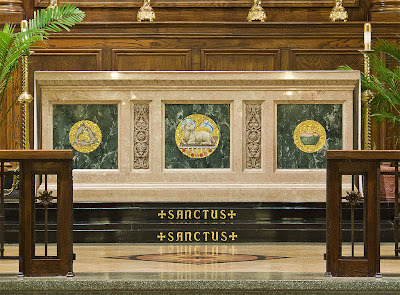 I remember the walls on both sides of the Altar were all mosaics, does anyone else remember that? 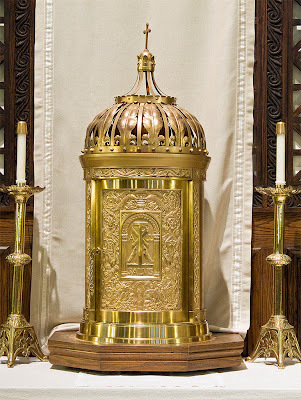 Young Catholic STL asked about what was in place before the tabernacle. I think it was a statue of Mary and Joseph on the opposite side. Candles were below them. Also the podium was on the opposite side from where it is in the pictures. I attended 4th through 6th grade. That church, school, and the nuns set my feet in the right direction for all of my life. Of 9 schools attended, nothing can touch All Saints. I love her so. Yes! There was a 3rd Santus Step. I have a memory about them. A girl couldn't be an alter boy in those days and I was hurt that I couldnt be at the alter. So one Saturday I walked back and since no one was there, I sat on the Santus steps and said my prayers. Beautiful photos! We were just there a few weeks ago, visiting from San Francisco. Pat, I deleted the section on Mass times.